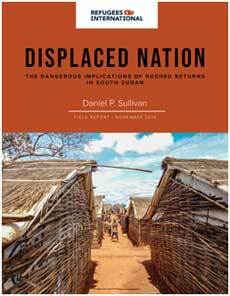 WASHINGTON DC, Nov 30 2018 (IPS) - South Sudan is facing one of the worst displacement crises in the world today. More than half of the population is food insecure and, if not for international humanitarian aid, the country would almost certainly have already faced famine. A new peace agreement is bringing cautious hope to the displaced and is driving discussions of returns from both within and outside of South Sudan, particularly for those in UN-hosted Protection of Civilian sites (PoCs) within the country. However, security concerns and humanitarian needs remain immense, and rushed returns risk fueling ethnic tensions and costing lives. These challenges are amplified by the broader realities of ongoing instability in some pockets of the country and active manipulation of aid by the South Sudanese government and opposition authorities. Aid manipulation takes many forms, from the use of instability as an excuse to block aid delivery to opposition areas, to the blatant diversion of aid away from civilians and into the hands of soldiers. One of the most egregious ways that aid risks being manipulated is in reinforcing the dislocation of ethnic groups, or what some observers even have described as ethnic cleansing. Ethnic minorities have been targeted with violence throughout South Sudan’s civil war, dramatically altering the ethnic makeup of some areas of the country by displacing their populations. Several large towns and other areas have been depopulated of their traditional ethnic communities and are now being repopulated by members of the dominant Dinka ethnic group. Returns of internally displaced persons (IDPs) and provision of aid that fails to consider this context risk reinforcing demographic shifts born of atrocities and the inequalities, impunity, and ethnic tensions that go with these shifts. The UN, international donors, and international nongovernmental organizations (INGOs) have played – and must continue to play – a vital role in providing protection and life-saving humanitarian aid to millions of people in South Sudan. INGOs and UN agencies have taken several measures to counter aid manipulation; such efforts must continue and be enhanced. If aid is to be used to maximum effect, however, international actors must speak with a unified voice, backed by credible threats of consequences, against the worst instances of such manipulation. Moreover, any returns, starting with those from the PoCs, must include measures that ensure they are truly safe, voluntary, and dignified, and do not inadvertently fuel the very suffering international actors seek to mitigate. Ensuring the safety and dignity of returns from PoCs, avoiding aid manipulation, and preventing the forced dislocation of ethnic groups are critical issues that the government of South Sudan, international organizations, and donor governments must urgently address. They are important in and of themselves but also will have far-reaching implications for the prospects of return and well-being of millions of South Sudanese displaced both within and outside of the country. o	Adherence to international guidelines on returns. o	Intentions surveys to ensure that IDPs are informed and willing to leave the PoCs. o	Security and conflict sensitivity assessments of the proposed areas of return. o	Facilitated “go-and-see” visits so IDPs can assess the conditions in areas of return. o	Measures to address housing, land, and property (HLP) issues. o	Programs to supply basic services and livelihood opportunities in the areas of return. o	Coordination of returns and PoC closures and sharing of lessons learned across the humanitarian community through a mechanism such as the National Durable Solutions Working Group, an existing but largely inactive body of UN agencies and NGOs working on PoCs and IDP issues. 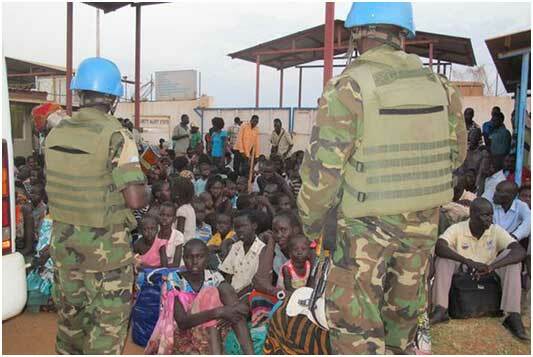 •	UNMISS should focus its patrols on areas of potential return and areas with specific protection concerns. Such concerns should be identified through ongoing dialogue with humanitarian organizations and PoC residents and should include the ability of women to collect firewood and visit markets. UNMISS, with political support from the UN Security Council, should assert its right to patrol where and when risks are highest to civilians, including nighttime. •	UNMISS should improve protection in PoCs through such measures as providing better lighting, securing border fences, and exploring ways to better address criminality. •	UN agencies, donors, and humanitarian groups should take strong, unified action in response to aid manipulation. Attacks or threats against aid workers, or aid diversion to armed actors should be met with diplomatic censure at the highest levels, targeted action against responsible officials, and, in the worst cases, withholding of aid to specific areas where continuing to provide aid would do more harm to civilians than good. o	UN country leadership should empower the UN Office of the Coordinator of Humanitarian Assistance (OCHA), and donors should further support OCHA with resources to track and record incidents of aid manipulation more comprehensively. o	UN leadership and donor representatives in country should address incidents immediately and directly at the highest levels of government. o	UN agencies, donors, and humanitarian organizations should support OCHA and groups like the South Sudan NGO Forum, the main NGO networking body in the country; and the Conflict Sensitivity Resource Facility (CSRF), a joint donor initiative to better inform programming decisions and strategies, to expand efforts in sharing information on aid manipulation. o	Humanitarian organizations should build stronger internal awareness of aid manipulation through the collection of lessons learned and rigorous handovers for new staff. o	UN agencies and humanitarian organizations should continue to strengthen risk management efforts, including through implementation of the Contractor Information Management System, a common system for agencies to screen contractors; and increased biometric registration. •	Fully fund the humanitarian response in South Sudan at sustained levels. •	Ensure that funding of resilience and recovery projects do not inadvertently reinforce ethnic dislocation in the country. The UN Development Program (UNDP), United States Agency for International Development (USAID), and others involved with the Partnership for Recovery and Resilience should ensure that projects are informed by adequate conflict-sensitivity analysis. •	The Commission of Human Rights on South Sudan, mandated by the UN Human Rights Council, should investigate the ethnic dislocation taking place in the country. •	The United States should re-appoint a U.S. Special Envoy for Sudan and South Sudan. The envoy should have experience and stature in the region and enjoy the backing of the White House. The envoy should prioritize support for the peace process and combatting aid manipulation and ethnic dislocation. Pass the Internally Displaced Persons (IDP) Act, which would commit the government to focusing greater attention and providing more funding to IDP issues in line with global standards, and join the African Union Convention for the Protection and Assistance of IDPs in Africa (the Kampala Convention). Grant an official government body the authority and responsibility for addressing internal displacement and provide that body with dedicated funding. Establish a Special Court for adjudicating housing, land, and property (HLP) issues arising in the context of ethnic dislocation taking place in towns like Malakal and Wau. Ensure accountability for atrocities committed during the civil war by establishing the hybrid African Union–South Sudanese court called for in the September 2018 peace agreement to try those responsible for crimes against humanity and war crimes.